NEW YORK -- An American cameraman helping to cover the Ebola outbreak in Liberia for NBC News has tested positive for the virus and will be flown back to the United States for treatment. NBC News identifies him as Ashoka Mukpo, 33. NBC News President Deborah Turness said Thursday the rest of the NBC News crew, including medical correspondent Dr. Nancy Snyderman, will also be brought back to the U.S. and placed in quarantine for 21 days "in an abundance of caution." Mukpo is the fifth American to contract the virus. 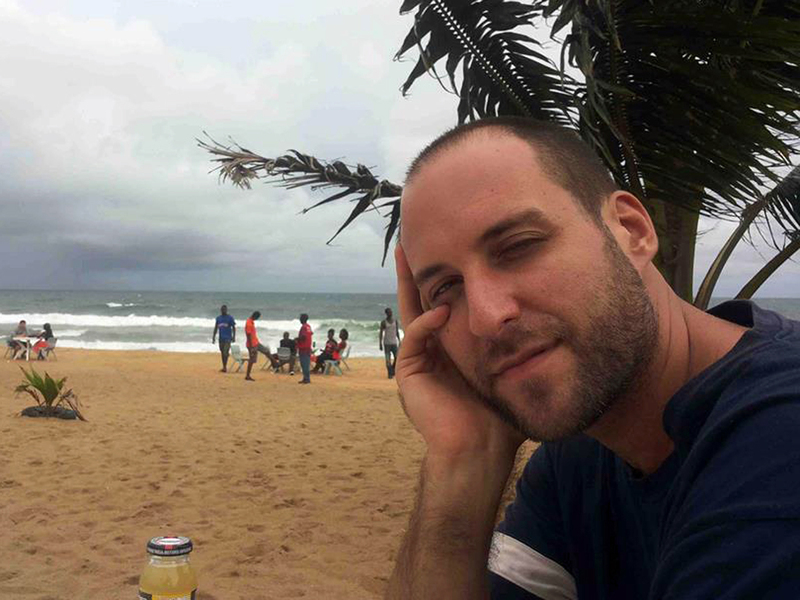 Also, Thomas Eric Duncan, who lives in Liberia but was visiting family members in Dallas, became the first person to test positive for Ebola in the U.S.
Mukpo, a freelancer, has been working in Liberia for three years for Vice News and other media outlets, and has been covering the Ebola epidemic. He began shooting for NBC on Tuesday. Mukpo began feeling tired and achy Wednesday and discovered he had a slight fever. He went to a treatment center Thursday to be tested, and is being kept there, said Snyderman, who was interviewed Thursday night on "The Rachel Maddow Show" on MSNBC. Snyderman said she believed his exposure to the virus happened sometime before he started working with the NBC crew, since it is usually eight to 10 days before the first symptoms are seen. "The good news is this young man, our colleague, was admitted to the clinic very, very early," she said. "I spoke with him today. He's in good spirits. He's ready to get home - of course, appropriately concerned. But he will be airlifted out soon." She said that neither she nor the other three NBC employees has shown any symptoms or warning signs of Ebola infection. "We observe the custom now, which is to not shake hands, to not embrace people, to wash our hands with diluted bleach water before we enter the hotel," she said. "We dip our feet in bleach solution." She said she and the rest of her crew present little chance of giving it to anyone, unless they get sick. "We will be taking our temperatures twice a day, checking in with each other, and if any one of us suddenly spikes a fever or gets symptoms, we will report ourselves to the authorities," she said. "We are taking it seriously." The four other Americans who have been infected were doctors or relief workers, and all were brought back to the U.S. for treatment, the Reuters news agency points out. "Aid workers Dr. Kent Brantly and Nancy Writebol contracted the disease at a relief agency in Monrovia in July," Reuters notes. "Last month, Dr. Rick Sacra tested positive after working in a Liberian hospital. They have all since been released. "An American doctor diagnosed with Ebola in the neighboring country of Sierra Leone arrived at Emory University Hospital in Atlanta for treatment on Sept. 9 and is still being treated. He has not been publicly identified." In Dallas, Thomas Eric Duncan is in isolation after testing positive for Ebola, and dozens of people he was around are being watched closely for signs they might also have the virus. Several of his family members have been placed under quarantine. Reuters observes that news of a journalist falling ill with the virus "seemed to raise the stakes for other members of thenews media trying to cover the worst Ebola outbreak on record onthe ground in Liberia, the nation hardest hit by the epidemic."